For the book series, see Young Sherlock Holmes (books). For the 1982 television series, see Young Sherlock: The Mystery of the Manor House. Young Sherlock Holmes (also titled as Young Sherlock Holmes and the Pyramid of Fear) is a 1985 American mystery adventure film directed by Barry Levinson and written by Chris Columbus, based on the characters created by Sir Arthur Conan Doyle. The movie depicts a young Sherlock Holmes and John Watson meeting and solving a mystery together at a boarding school. Meanwhile, a hooded figure uses a blowpipe to shoot Bentley Bobster and Reverend Duncan Nesbitt with hallucinogenic thorns, causing the men to experience nightmarish hallucinations resulting in their deaths. Holmes suspects foul play but is rebuffed by Scotland Yard policeman Lestrade (Roger Ashton-Griffiths) when he suggests a connection between the deaths. Holmes is unjustly expelled from the Academy due to a rival student Dudley's machinations, having had Holmes framed for cheating. As Holmes reluctantly prepares to leave, Professor Waxflatter is shot with a hallucinogenic thorn and accidentally kills himself while trying to fend off imaginary gremlins. As Waxflatter dies he whispers the word "Eh-tar" to Holmes. Holmes secretly meets with Watson and Elizabeth and begins his investigation of the murders. Piecing together the clues – a jingling-bell sound made by the killer, a piece of cloth, and the blowpipe dropped at Waxflatter's murder scene – the trio uncover the existence of Rame Tep, an ancient Egyptian cult of Osiris worshippers. The cult’s main weapons were blowpipes, used to shoot thorns dipped into a solution made of plant extract which causes the victim to experience realistic, nightmare-like hallucinations. They track the cult to a London warehouse where the Rame Tep are conducting human sacrifices in a secret underground wooden pyramid. After interrupting one of their ceremonies, Holmes, Elizabeth, and Watson are chased by the Rame Tep and shot with thorns, barely escaping with their lives into a cemetery. They all experience hallucinations (Elizabeth that she is being chased by the undead, Watson that his favorite stuffed pastries are coming to life and force feeding themselves to him, and Holmes that his dead father is furious with him), but Holmes is able to keep them all level-headed and they survive. The following evening, at Waxflatter’s loft, Holmes and Watson discover a picture of the three victims and a fourth man, Chester Cragwitch (Freddie Jones). However the three are discovered by Professor Rathe and the school nurse Mrs. Dribb (Susan Fleetwood) who prepare to expel Watson and Elizabeth in the morning. That night, while Elizabeth heads to Waxflatter's loft to salvage his work, Holmes and Watson locate Mr. Cragwitch who explains that in his youth he and the other men had discovered an underground pyramid of Rame Tep while planning to build a hotel in Egypt. Their find led to an angry uprising by the local populace which was violently put down by the British Army. A local boy named Eh-tar and his sister vowed revenge after their parents were killed. Cragwitch is then shot by a poisoned thorn and tries to kill Holmes, but he is knocked unconscious by Inspector Lestrade who reconsidered Holmes' advice after he himself was accidentally poisoned by the hallucinogen. As they return to the school grounds, a chance remark by Watson causes Holmes to realize that Rathe is Eh-Tar, but he and Watson arrive too late to stop Rathe and Mrs. Dribb, who is revealed as Eh-Tar's sister, from abducting Elizabeth. Using Waxflatter’s self-propelled, heavier-than-air flying machine, they travel to the warehouse just in time to prevent Rathe from sacrificing Elizabeth, setting the cult's pyramid temple on fire. As Rathe escapes with Elizabeth, Mrs. Dribb swallows one of her own hallucinogenic thorns in a fight with Holmes. Watson successfully thwarts Rathe’s escape by sabotaging his carriage. Rathe then tries to shoot Holmes, but Elizabeth intervenes and is wounded instead. Enraged, Holmes duels Rathe and manages to get the better of him when Rathe falls through the frozen River Thames. Holmes returns to Elizabeth’s side and holds her as she dies. Afterwards, as he exchanges goodbyes with Watson, Holmes explains how he figured out the identity of Rathe and Dribb, with Watson pointing out that "Rathe" is "Eh-Tar" spelled backwards – a clue that Holmes had failed to notice. Holmes says he will transfer to another school to take his mind off Elizabeth. Watson gives his friend a pipe as a farewell present. As Holmes leaves by horse carriage with his new detective outfit, Watson's older self (the Narrator) expresses that he was certain he would have more adventures at Holmes' side. In a post-credits scene, Rathe is revealed to be alive; he checks himself into an Alpine inn with a new name, “Moriarty”, foreshadowing his role as Holmes' future nemesis. Nigel Stock as Rupert Waxflatter. Stock had previously played Watson in the 1965 television series of Sherlock Holmes. Michael Hordern as Older John Watson (voice), the narrator of the story. "The thing that was most important to me was why Holmes became so cold and calculating, and why he was alone for the rest of his life," Mr. Columbus explains. "That's why he is so emotional in the film; as a youngster, he was ruled by emotion, he fell in love with the love of his life, and as a result of what happens in this film, he becomes the person he was later." The movie explains where Holmes gains the attire popularly associated with him. His pipe is shown as being a Christmas present from Watson, the hunting hat originally belonged to Professor Waxflatter and is given to him by Elizabeth after the professor dies, and the cloak is taken from Rathe ("Call it a trophy; the skin of a leopard") after Holmes defeats him. The film is notable for including the first fully computer-generated photorealistic animated character, a knight composed of elements from a stained glass window. This effect was the first CG character to be scanned and painted directly onto film using a laser. The effect was created by Lucasfilm's John Lasseter (now chief creative officer at Pixar Animation Studios and Walt Disney Animation Studios) before Pixar was sold the next year. In the United Kingdom and Australia, the film was titled Young Sherlock Holmes and the Pyramid of Fear; in Italy Pyramid of Fear (in Italian: Piramide di Paura). As well in the UK, there was an earlier 1982, made for television, film called Young Sherlock: The Mystery of the Manor House featuring a young Sherlock Holmes, which ran for 8 episodes. The fencing scenes were shot at Penshurst Place in Kent. The film music was composed and conducted by Bruce Broughton who has a long-standing history of scoring orchestral film soundtracks. The music for the film was nominated for Grammy and also received a Saturn Award. The film soundtrack, released by MCA, was released on audio tape and vinyl but not compact disc. A limited edition of the entire score was released as a promo CD in 2003; Intrada issued the entire score commercially in 2014. Illusionist David Copperfield used the music from the soundtrack for several segments of his The Magic of David Copperfield XIII: Mystery on the Orient Express television special, in which he levitated an entire train car from the famed Orient Express. This is also one of only three Amblin Entertainment productions on which the logo is accompanied by the music composed for it by John Williams; the others are The Color Purple and The Money Pit. The film grossed around $19 million against an $18 million budget. The film received mixed to positive reviews, with a 65% on review aggregator Rotten Tomatoes. Roger Ebert gave the film 3/4 stars and Christopher Null of Filmcritic.com called the film "great fun". Reviewing the film for The New York Times, Leslie Bennetts called it "a lighthearted murder mystery that weds Sir Arthur Conan Doyle to the kind of rollicking action-adventure that has made Steven Spielberg the most successful movie maker in the world". Pauline Kael wrote, "This sounds like a funnier, zestier picture than it turns out to be.... As long as the movie stays within the conceits of the Holmesian legends, it's mildly, blandly amusing. But when one of the imperilled old men gives an elaborate account of the background of the villainy... your mind drifts and you lose the plot threads. And when the picture forsakes fog and coziness and the keenness of Holmes' intellect – when it starts turning him into a dashing action-adventure hero – the jig is up.... the movie lets you down with a thump when Holmes and his companions enter a wooden pyramid-temple hidden under the London streets.... There's a resounding hollowness at the center of this picture – Levinson's temple of doom". More recently, R.L. Shaffer writing for major internet review site IGN felt the film "doesn't hold up all that well" and that ultimately "the film shall remain a cult classic – loved by some, but forgotten by most. ", while DVD Verdict stated that the film was both "a reimagining of the detective's origin story, but it is also respectful of Arthur Conan Doyle's work" and "a joy from beginning to end." A video game based on the movie was released in 1987 for the MSX called Young Sherlock: The Legacy of Doyle released exclusively in Japan by Pack-In-Video. Although the game is based on the movie, the plot of the game had little to do with the movie's story. ↑ Ebert, Roger (1985-12-04). 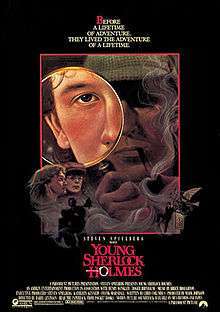 "Young Sherlock Holmes Movie Review (1985) | Roger Ebert". Rogerebert.suntimes.com. Retrieved 2013-11-10. 1 2 3 4 Leslie Bennetts (December 1, 1985). "Young Sherlock Holmes (1985) IMAGINE SHERLOCK AS A BOY...". New York Times. Retrieved March 17, 2011. 1 2 "Visual and Special Effects Film Milestones". Filmsite.org. Retrieved 2013-11-10. ↑ "The history of CGI list". Listal.com. 2010-12-22. Retrieved 2013-11-10. 1 2 "Section 14: CGI in the movies". Design.osu.edu. Retrieved 2013-11-10. ↑ Kent Film Office. "Kent Film Office Young Sherlock Holmes Film Focus". ↑ "film menu". Levinson.com. Retrieved 2013-11-10. ↑ Friendly, David T. (2000-07-05). "'Purple,' 'africa' Pace Box Office - Los Angeles Times". Articles.latimes.com. Retrieved 2013-11-10. ↑ "Young Sherlock Holmes". Rotten Tomatoes. Retrieved 2013-11-10. ↑ Roger Ebert (December 4, 1985). "Young Sherlock Holmes". Chicago Sun-Times. Retrieved March 17, 2011. ↑ "Young Sherlock Holmes". Filmcritic.com. Retrieved March 17, 2011. ↑ Kael, Pauline. Hooked. New York: Dutton, 100-02. 1 2 "Young Sherlock Holmes". IGN. Retrieved March 17, 2011. 1 2 "Young Sherlock Holmes". DVD Verdict. Retrieved March 17, 2011.